Tom Cruise and Cameron Diaz star in this romantic action-comedy about an unfailingly polite (and somewhat crazy) spy and the girl next door he falls for. No matter your opinion on Tom Cruise, he is a hoot here as he spoofs his own “invincible action hero” screen image as well as his own eccentric real-life persona. In no other film has he made me laugh so hard. Diaz, for her part, evolves slowly from damsel-in-distress to a strong and courageous action heroine, and she is a surprisingly good comic and romantic foil for Cruise. Their chemistry, terrific action sequences, and very funny dialogue carry the film over its rather formulaic plot, some slow patches, and wide gaps in the narrative. 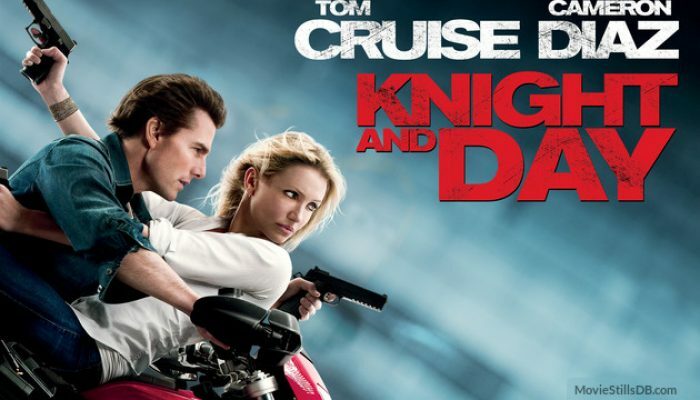 Knight and Day is a great date movie for those looking for a balance of laughs, thrills, and romance. Audiences should know that there is brief strong language, a couple of innuendos (and the stars briefly appear in swimwear), and a good deal of violence, though the tone of the latter is so over-the-top that it is clearly dark humor and parody of the ridiculousness of “invincible action-hero” movies. Still, those troubled by any of the above should look elsewhere. If Knight and Day whets your appetite for romantic spy comedies, try Undercover Blues.